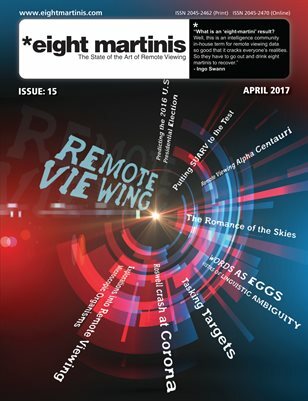 We are looking for articles, stories, examples of remote viewing for the sixth full color remote viewing magazine – eight martinis. Its going strong with thousands of downloads per issue, printed copies being order form around the globe and printed copies now stored on file with the British Library. We also have ISSN numbers for both the online and printed versions. So please get your ideas juiced-up and in flow and your pens a moving – remember it’s your magazine, the participation of the community is the only thing that can keep it going. If I can get any content submissions by Dec 5th then we can get the magazine out in January to start the new year well.